The year 1968 is burned into American history. For the players of Carbondale High School’s football team, 1968 was their season of destiny. It was the last undefeated season in the school’s history, and that team served as a launching pad for extraordinary careers and friendships. Destined for Greatness tracks this team through their remarkable season and beyond. More than a sports story, this is an American story about a team seeking greatness against great odds. It has been more than two years since Roger Medlen suggested to Mike Given at the Carbondale Community High School Alumni Christmas Eve gathering in Carbondale (at a favorite old “watering hole” Midland Inn) if he would be interested in writing a book about the 1968 Terrier Football team—still, the last Carbondale High School football to go undefeated— now, nearly 46 years later. It was a reasonable request and suggestion for Roger to make to Given. Mike was an excellent writer and after many years of living and working in the San Francisco Bay area, Given returned to Carbondale to complete three degrees from Southern Illinois University, including a Ph.D in Literature. He had been a long-time professor of Writing and English at Stephen F. Austin State University in Nacogdoches, Texas. That suggestion and encounter lead to Mike contacting me to suggest that perhaps I could do a more complete job of reconstructing the narrative of our season and correlate some of the memories of others. After all, I was not only a member of the team, as a back-up receiver (I had a good view of each game); I was also the Sports Editor of the school newspaper, The Monitor, in which, about 60% of its content was generally about the sports teams, our games, and related events—homecoming, etc. I did have all my old clippings, as well as copies of yearbooks, awards ceremony and even game programs. I also owned a market research company, and I could organize a web-based survey of our teammates, classmates, cheerleaders, and others, who could provide some of their own insights, memories and impacts of that special season and time in history—in small town, mid-America. Mike also agreed to contribute an essay of his recollections and a discussion of the cultural events and backdrop of the era. Later, Roger Medlen, the catalyst for the entire project agreed to schedule and conduct an interview with the team’s coach, Vern Pollock in April, 2013. This fun look back at the team and the times, and our unique coach, is contained in the Appendix of this book. The interview was conducted by Roger and teammate, Larry Eastwood, one of the key defense players on the 1968 team. Both still live and work in Southern Illinois, as does the retired coach. In an effort to accurately recount the story of the team, I researched many of the articles written about it in local print media, primarily the Southern Illinoisan. It was my perception when I was growing up in Carbondale for junior high school and high school, that the local media—throughout the region—newspapers and radio—covered high school sports “like a blanket.” It seemed like someone I knew was always getting their picture in the paper or an article written about them. References to many of these articles are made throughout the story of 1968 Terriers in this book. 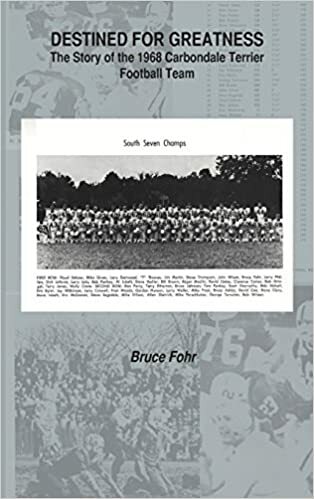 The title of the book comes from an article written by Geary Deniston in 1998 for the Carbondale Times in a story he wrote about the team on its 30-year anniversary. It was titled: “1968 Terrier Team was Destined for Greatness”. More than 15 years later, we think the headline and title still works. While the driving the force behind this book is more nostalgia than any significant message or meaning; it did occur to me that this was a special group and the bond of the teammates and other classmates has remained strong for now nearly 50 years—since we entered the halls of CCHS. We always knew that we were blessed, fortunate, lucky and special during our junior high and high school days. In many unexpected ways, things just seemed to come together for us and/or line up in timely, serendipitous fashion. Often, many of us expected to excel in whatever we did. And, as luck would have it, things worked out that way… especially for the 1968 Terrier football team.